Companies! Shape up your social media policy or else?! Update: Check out Techmeme for a slew of interesting viewpoints on this topic. I’ve always been a strong advocate of companies proactively creating and sharing social media guidelines within their organizations to encourage their employees to both build a strong brand for themselves on social platforms like Facebook or LinkedIn but at the same time, help them avoid painful pitfalls. HuffingtonPost just picked up a New York Times piece that shone the spotlight on a “ground breaking case”. 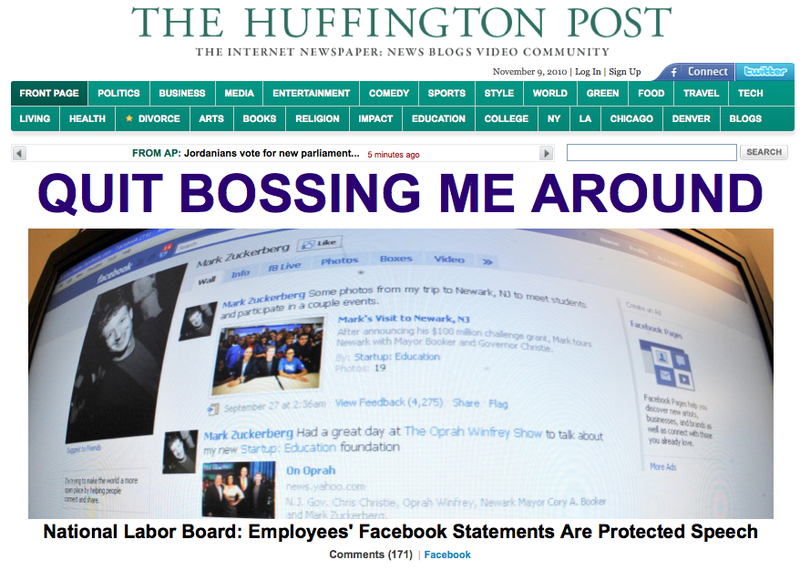 The National Labor Review Board called the firing of an employee (on the basis of a Facebook post), illegal. What does this case mean for companies? It remains to be seen how this case pans out as it’s pending review on Jan 25th. That said, if you’re a small business or a corporation, first check if you’ve a social media policy or guidelines but more importantly, have you shared this information across your organization, the larger you are – the more complicated that may be. As for this case, the resolution could go either way if the company can make a good case for defamation. That said, it was super-interesting that the supportive comments the employee received from her colleagues is what made the labor board equate this with a union, which they argue is protected speech. As a company, there’s not much you can do over your employees’ usage of social media in their personal time. That’s a given. But, trying to get them to understand what responsible usage of social media is, can and should be done. Education is better than a cure. Having a social media policy is mandatory. Tip: getting your employees to help craft it collaboratively is ideal. At LinkedIn, over a year ago, we hosted two brainstorm sessions where we invited all interested employees to learn, share and help craft our guidelines. This led to our first set of social media guidelines which we socialized internally, but guess what. Since then we’ve more than doubled in the # of employees and so we now include the guidelines during orientation. Also, keep in mind all your global teams and the international laws that are in play here. Stay tuned for more how-to posts on this topic. In the meanwhile, check out my other posts on social media guidelines here. Does your company have a set of social media guidelines? Leave a comment. For more thoughts from my peers in this space. Check out Techmeme. Anyway, I agree with you, laying it down collaboratively is the best course of action, that’s what I am doing in my company as people are getting more and more into social media. I was planning on sharing it. We’ve definitely tried to keep it as simple as possible. Stay tuned for an update. Y’know where to find me should you have any questions. p.s. I’ll also be featuring guest posts / case studies from other brands on the blog.